On the 13th September 2011, the Nirvana: In Bloom exhibition opened at the Loading Bay Gallery, Brick Lane, London. 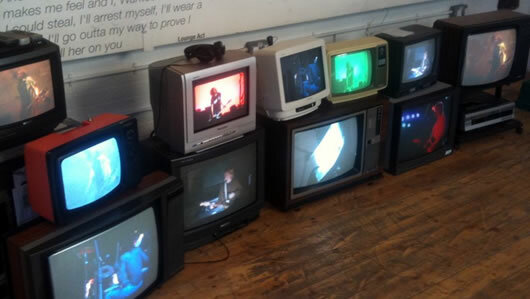 Pure Energy were commissioned to set-up a bunch of retro televisions fed with rare Nirvana and Kirk Cobain footage. The look was grungey with the TV's sitting on the floor and on top of each other. We use a couple of green screens and black and white screens to add interest to the overall aesthetic. The screens were fed from DVD players set on repeat and signal convertors were used to allow the old TV's to work from the new DVD players.